In the totally implantable cochlear implant (TICI) system, the external parts of the currently available cochlear implants (CIs) are integrated into the implant and hence, become invisible and well protected. Recipients using such a system would significantly benefit from 24/7 hearing and the overall improved quality of life that comes with an invisible hearing aid (related to playing sports, sleep comfort, reduced social stigma, etc.). A TICI system is not commercially available to date, mainly because of technical difficulties of making an implantable microphone (IM). 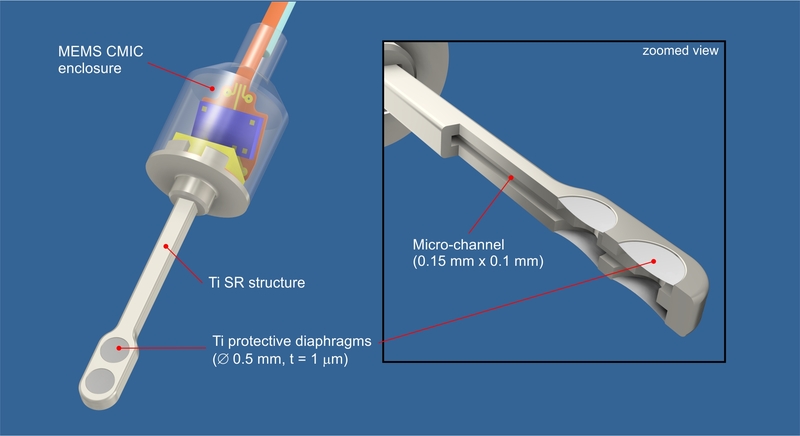 In contrast to an external microphone, an implantable one needs sophisticated packaging to meet stringent requirements for long term biocompatibility, safety and reliability. In addition, high sensing performance, low power consumption and simple surgical approach have to be considered during the design phase. The goal of the present project is to develop and validate an IM for a TICI system. Figure 1. (fig 1_ICAR concept.jpg) Schematic drawing of the present concept of an IM for a TICI system. The illustration shows the main parts of the intracochlear acoustic receiver (ICAR) and their anatomical locactions. The sound receptor (SR) with up to 4 sound receiving protective diaphragms, the enclosure of the MEMS condenser microphone (CMIC) and the system for static pressure equalization (SPEQ) form a biocompatible Ti packaging structure which hermetically seals the MEMS CMIC against body tissue. The SPEQ system represents a passive adaptive volume which compensates for ambient static pressure variations and thus, provides stable sensing performance. 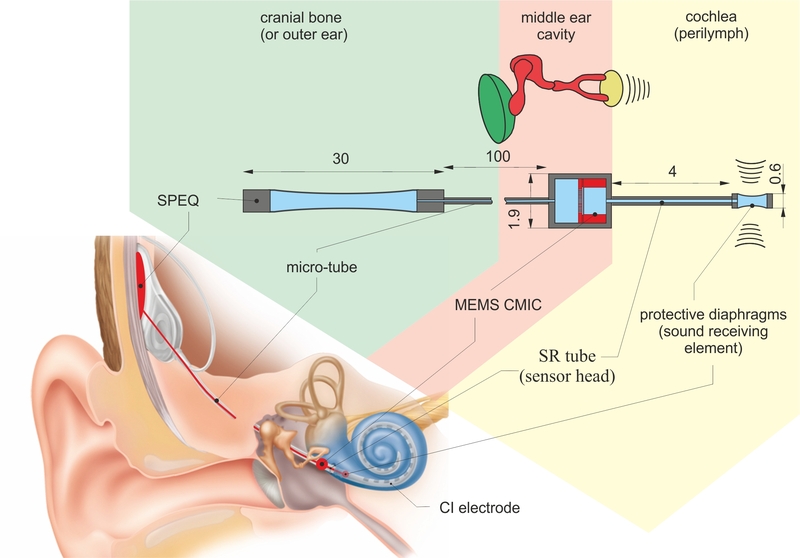 Our approach for an IM is a device which measures the pressure fluctuations in the cochlea (inner ear), which are induced by the outer and middle ear chain, a so-called intracochlear acoustic receiver (ICAR, Fig. 1). An ICAR benefits from the amplification and directionality cues of the ear anatomy, whilst minimizing interference by body noises. The ICAR might potentially be integrated into the existing CI electrode array and hence, such a TICI may benefit from a similar surgical procedure as applied for a CI. The design concept for the ICAR is based on a commercially available MEMS condenser microphone (MEMS CMIC) as it is used for telecommunication devices. 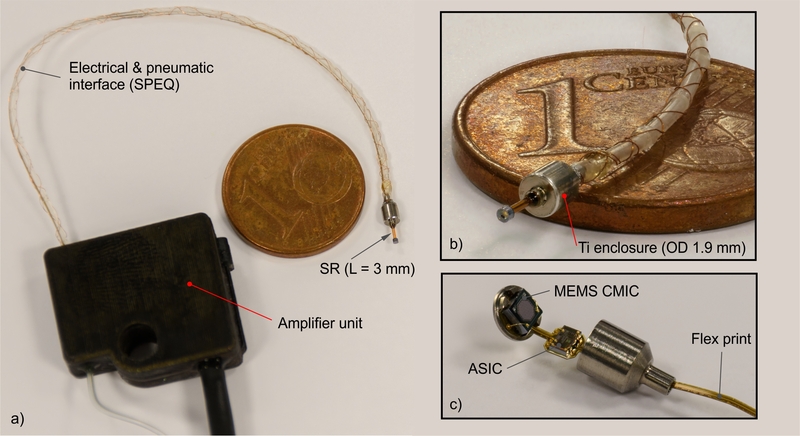 The MEMS CMIC of the ICAR is fully packaged in a biocompatible enclosure made out of titanium (Ti) but still enables sensing of the pressure fluctuations in the cochlea. The sensing capability of the MEMS CMIC is maintained by sealing its pressure sensing port with thin protective Ti diaphragms (PD). Sound induced vibrations of the PDs cause pressure fluctuations within the gas-filled volume formed by the PDs and the sensing element of the MEMS CMIC. Since the size of the MEMS CMIC enclosure prevents its insertion into the cochlea, only the thin sensor head carrying the PDs, called the sound receptor (SR), is inserted into the cochlea duct. The enclosure remains in the middle ear cavity adjacent to the entrance of the cochlea (Fig. 1). Figure 2. (fig 2_prototype I) The first prototype (PT I) of the proposed design concept of the ICAR (a). PT I uses a commercially available MEMS CMIC in its original packaging (c, top enclosure removed). An acrylic adapter interconnects the pressure port of the MEMS CMIC and the SR (fused silica capillary tube). The PD, a 1 micron thick polyimide diaphragm supported by a thin-wall cylindrical structure made out of single crystal silicon, seals the front end of the SR tube (b). The development process of the ICAR started with a simplified version of the proposed concept. The first prototype (PT I) is not implantable and does not meet the sensing performance targeted in the final ICAR (Fig. 2). It was mainly designed to validate lumped element modelling of the sensor concept and to measure and quantify intracochlear sound pressure (ICSP) in human and sheep temporal bones, providing crucial information towards an ICAR of a TICI system [1, 2]. The data from ICSP measurements were in good agreement with results in the literature . Figure 3. (fig 3_prototype II) Prototype II (PT II) combines the SR from PT I and a custom-made Ti enclosure for the MEMS CMIC with optimum form factor for surgical insertion (b). The flexible interface between microphone and the amplifier unit simplifies surgical insertion and sensor fixation (a). A flexible printed circuit board (FCB) enables packaging of the MEMS CMIC and the corresponding ASIC unit in an enclosure with optimum form factor. In addition, it simplifies electrical interfacing due to an integrated FCB cable (c). As the next step, the second ICAR prototype (PT II) was designed and built such that surgical insertion into the cochlea was possible during acute large animal experiments. In PT II, a custom-made Ti enclosure for the MEMS CMIC was combined with the SR of PT I (Fig. 3). A flexible interface between the microphone and the external amplifier unit allows surgeons to insert and fix the sensor without using complex assisting tools (e.g. micro-manipulator). The acute large animal experiments revealed that the presented ICAR concept is a suitable receiver technology for TICI systems. Figure 4. (fig 4_prototype III) CAD model of prototype III (PT III) of the ICAR combining the MEMS CMIC enclosure from PT II and a Ti SR with four 1 micron thick Ti diaphragms. The SR structure and the enclosure are laser welded together. The multi-diaphragm SR design is required to meet the targeted sensing performance (sensitivity, bandwidth). 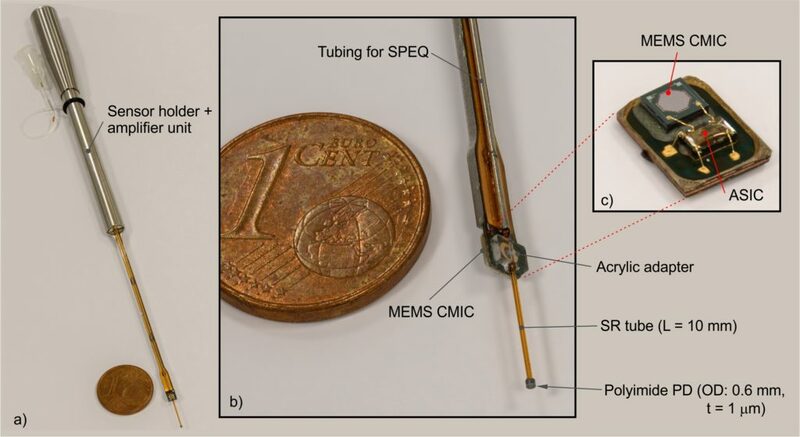 The micro-channel within the SR pneumatically interconnects the PDs and the MEMS CMIC. Currently, a fully biocompatible ICAR (PT III, Fig. 4) is under development. PT III, which is planned to be used for chronic large animal tests, is expected to fulfill all requirements for application of the ICAR to a TICI system, including high performance, low power consumption and good system integration. The key feature of PT III is the Ti SR with four PDs instead of one as used in PT I and PT II. It is fabricated from thin Ti sheets which are structured by photo etching and hermetically joined by diffusion bonding. The 1 micron thick PDs are deposited onto the bare SR structure using DC magnetron sputtering on top of a low temperature decomposable polymer material (Fig. 5). Figure 5. (fig 5_Ti SR) Tip region of the Ti SR of PT III after DC magnetron sputtering of a 1 micron thick Ti layer on both sides of the SR (picture from the first diaphragm fabrication trial on the multi-diaphragm SR structure design). This work was supported by the Baugarten Stiftung Zürich, Switzerland, by the Cochlear Technology Centre Belgium and by Cochlear AG, European Headquarters, Switzerland.